For much of July and August, Vienna’s concert halls lock their doors. But the state of Lower Austria, which embraces Vienna from all sides, makes up for the shortfall by hosting concerts across the entire countryside. Plethora means an excessive amount of something, especially more than you need or can deal with. Myriad means a multitude. Whether the 693 events and 107 venues of Lower Austria’s Musiksommer (music summer) are a plethora or a myriad, I leave you to decide. In any case, it’s a colossal fête. Technically, the Musiksommer starts in May and sees some stragglers in October. But through July and August, there is not a day without a concert. Most days the list is so long, the venues so intriguing, the musicians so great, there is only one easy decision – leave the city. Nestled at the feet of the first Alpine peaks, the gentle hills of Lower Austria and its four quarters or Viertel are all a relaxed drive from Vienna. Dotted with castles, palaces, abbeys, churches and breath-taking outdoor backdrops, it’s a marvelous stage for all kinds of music. The most “aristocratic” venue is undoubtedly Schloss Grafenegg. For classical music and big names, picnics on the lawn and strolls in an English park, this is the place to go. The Wellenklänge (sound waves) festival on the lake at Lunz am See is more eclectic: from jazz to folk to indie, its concerts take place on a floating stage that is a diving platform during the day. Also, the Glatt & Verkehrt festival, whose name means either knit & purl or slick & preposterous, offers a fabulous mix of world music, both traditional and contemporary. The little chamber music festival Pitten Classics is held in a mountain church. Hearing Schubert’s Forellenquintet with trout jumping in a near-by stream is my idea of perfection. Harriet & Friends, at the vast medieval Burg Feistritz 80 kilometers south of Vienna, is directed by cellist Harriet Krijgh – already a professor at Vienna’s Music University and an international rising star at 27– who favors exuberant performances of young classical brilliance.And the 50 concerts of Allegro Vivo are irresistible, with the students of its summer music courses playing alongside more than 70 well-known artists. At the end of the 19th century, the cool summer air of the Semmering pass drew the wealthiest and noblest, making it a town of luxury resorts and exquisite villas, with perhaps the grandest being the Südbahnhotel, built in 1881. 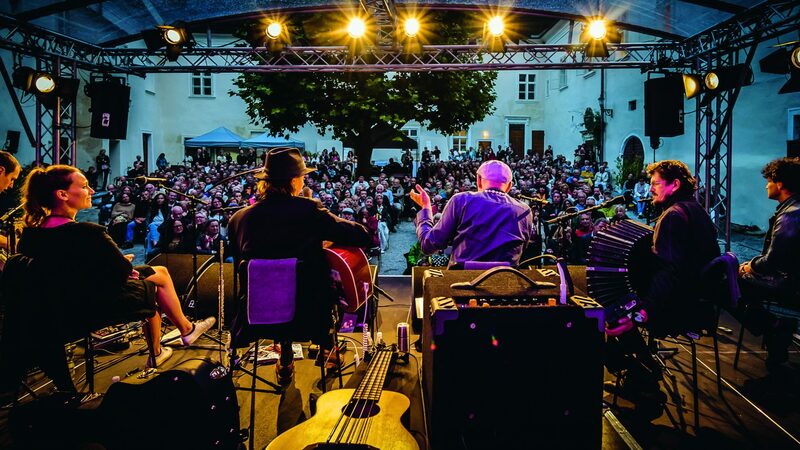 Defunct since the 1970s, many of the Kultur.Sommer.Semmering events take place in its empty halls: Here music is combined with recitation, but even if your German is a bit weak, tasting the elegance of that past epoch may well be worth the journey. Tucked away at the northern-most edge of the country is Schloss Kirchstetten and “the smallest opera house in Austria.” Isolated to the east by the Iron Curtain during the Cold War, the legacy of those times is still tangible – narrow, tree-lined roads, a rustic Heuriger still serving G’spritzter for €1.50. Experience bel canto close up, with the singers of Rossini’s Barber of Seville nearly in your lap. Teatro Barocco is another unconventional opera experience: charming, intimate and historically accurate performances, including candle-lit staging, baroque dances and opulent costumes. And big opera is just around the corner at Klosterneuburg Monastery, performed outdoors in its huge courtyard – this year, Verdi’s Traviata. I could go on! Concerts at the palaces of Wolkersdorf, Wilfersdorf, Maissau and Mühlbach, at the enormous abbeys of Zwettl and Altenburg … I will stop, but only for reasons of space and readers’ stamina. There is no single website for these multitudinous happenings. For an overview, a free 88-page booklet can be ordered from the Lower Austrian government (or down-loaded as a .pdf). Information printed on paper might seem retro, but the booklet is easier to use than a website, with events listed first by location and then by date. So get carried away and get out of town. Regardless of the direction you choose, it will be a road to musical adventure. Previous articleHas #MeToo Gone Too Far? Cynthia Peck is originally from Southern California, but she does not miss the sun. She lived in Tokyo for a decade, and she does miss the food. Now the Konzerthaus and Musikverein are her main living rooms, as are a few select restaurants around town. Trained in Vienna as a professional cellist, she also works at the Austrian Academy of Sciences, translates and edits lots of books about Buddhist epistemology and Austrian history, and is thinking about apprenticing as a chef. What she enjoys most is writing about music.